Treat dry hair to the Essence Absolue Cleansing Milk from Shu Uemura Art of Hair. Fortified with translucent micro-fine powders, the luxurious formula gently eliminates impurities and absorbs excess oil, whilst its water-free conditioning base replenishes and revives hair without extra weight. Working to control frizz and tame flyaways, the milk deeply moisturises strands from root to tip to leave tresses soft, sleek and healthy-looking with enhanced shine. Replacing both shampoo and conditioner, the treatment adds body and bounce to lack-lustre locks for a salon-style finish and enhanced vibrancy. 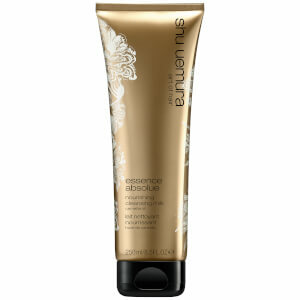 Sulphate, silicone and paraben free. Replaces both shampoo and conditioner. Use 1-3 times per week. Leave for 5 minutes, then rinse. (Thicker hair: rinse and repeat). Aqua / Water, Cetearyl Alcohol, Sodium Cocoamphopropionate, Hydroxypropyl Starch Phosphate, Behentrimonium Chloride, Coco-Betaine, Caprylyl Glycol, Isopropyl Alcohol, Glycerin, Sodium Chloride, Limonene, Hexyl Cinnamal, Benzyl Salicylate, Hydroxycitronellal, Benzyl Alcohol, Camellia Oleifera Seed Oil, Ethylhexyl Methoxycinnamate, Tocopherol, Glycine Soja Oil / Soybean Oil, Ci 19140 / Yellow 5, Ci 15985 / Yellow 6, Bht, Parfum / Fragrance.